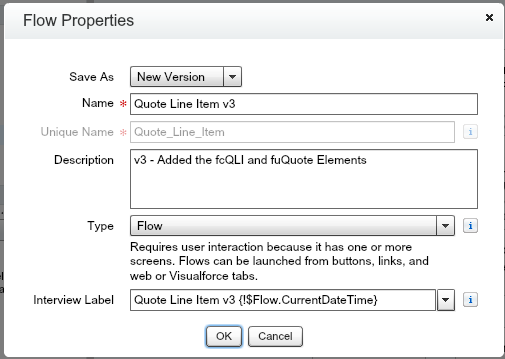 Part 2.C of the Learning Flow series will allow you to create the Quote Line Items and Update the Quote. To start, open the Quote Line Item Flow. From the Palette, click 0n Fast Create and drag it to the right of the aQRU Assignment Element. 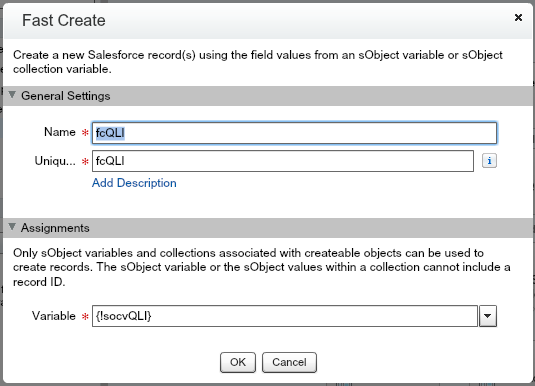 Enter the Name and Unique Name as fcQLI, for Fast Create Line Item, and set the Variable as socvQLI. Click OK. Connect the aQRU Assignment Element to the fcQLI Fast Create Element. This will create all the sovQLI variables stored in the socvQLI Collection Variable. Now you need to update the Quote with the Roll Up field. Click on Palette and drag the Fast Update Element to the right of the fcQLI Element. 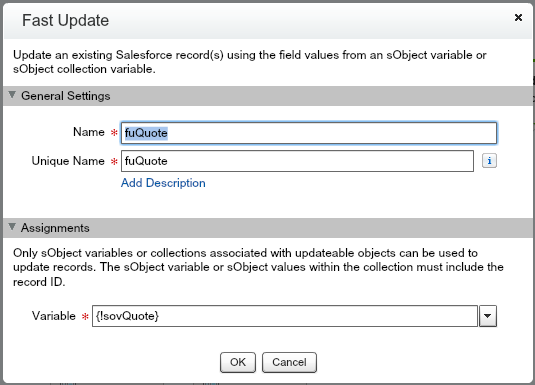 For the Name and the Unique Name, enter fuQuote for Fast Update Quote, and enter the Variable as sovQuote. Click OK. Connect the fcQLI Fast Create Element to the fuQuote Fast Update Element. That’s it! One of the shorter lessons, the Fast Create Element will create everything in the collection and the Fast Update Element will update the Quote! Congrats, your Users have now created a Quote and created the Quote Line Items. A future lesson, Learning Flow 4.A will teach you how to use Sub-Flows to send your Users to create the Quote Line Items when they start with the Quote Entry Flow! Sign up to receive new posts from Developing Flow in your email! Enter your email address to get Developing Flow posts right in your inbox!